Less than a week until Oscar night, and we’re more than halfway through our countdown, with a movie that some think just might win it all. “The Social Network,” directed by David Fincher and written by Aaron Sorkin, is the year’s most unlikely hit (well, OK, “Black Swan” could give it a run for its money). On the surface, it’s about the creation of a website; could anything sound less promising? 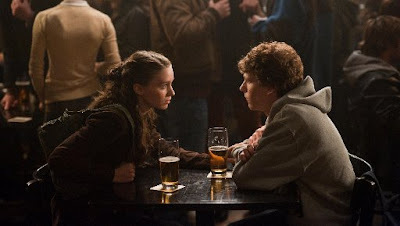 But two minutes into “The Social Network,” with that lightning-speed scene between Jesse Eisenberg and Rooney Mara — they talk like they’ve just escaped from a ’30s screwball — and it’s clear we’re watching something else entirely: a story of friendship lost, of ambition, of a young man made angry by the realization that brains aren’t enough to give him what he wants at college, of how the truth is made from what lies between stories. It’s pretty clear that the top awards are a duel between this movie and “The King’s Speech,” and some are saying it’s a contest between young and old, between the future and the past. (Fun tidbit, though: Tom Hooper, director of the “old” movie “The King’s Speech,” is the youngest nominated director this year.) I think it’s a fight between two very good movies, both of whom made a potentially dull subject come alive. Total Oscar nominations: Eight, including best picture, director, actor (Eisenberg), adapted screenplay, cinematography, score, editing, and sound mixing. Best chances for a win: The sole sure thing here is Sorkin’s screenplay, though it’s an odd fit in the “adapted” category (officially it’s based on a nonfiction book by Ben Mezrich, but Sorkin’s screenplay is very different both in tone and content). Eisenberg’s likely to stay in his seat, applauding for Colin Firth. Fincher has a definite shot at best director — particularly because this movie, with its snappy pace, feels more “directed” than some — though I’m now thinking that “The King’s Speech” will win best picture and we’ll see a picture/director split. Could be wrong, though. Trent Raznor and Atticus Ross’ score has many fans and could win its category, but the technical nods will likely go to a more visually flashy movie (i.e. “Inception”). Odds of this movie creating any fabulous Oscar-night weirdness: Well, if Mark Zuckerberg or the Winklevii show up, all bets are off. And the Academy missed a chance for some fun by not nominating Armie Hammer for supporting actor, for playing both Winklevoss twins (thanks to some nifty face replacement technology, and to model/actor Josh Pence, who is a very good sport). Otherwise, unless Rooney Mara shows up as Lisbeth Salander, things should be calm (other than Sorkin’s acceptance speech, which is bound to irritate at least a few people).